Back in 1998, I wrote this article when I came up with the concept for the River-Tank manifold. While this article is somewhat superceded by my later article, "Hillstream Loaches - The Specialists at Life in The Fast Lane", I was asked to move this article over here to the new site. This gave me pause for thought. I realized the old article still has value because it basically chronicles the development of my concept that in the 8 years that's passed has seen many people build their own versions of my design. 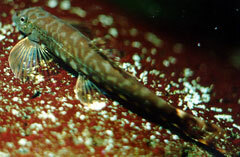 This has allowed them to successfully keep and in some cases breed Hillstream Loaches that people had difficulty in keeping alive before. It's also a historical record of the most significant period in my long fishkeeping hobby. 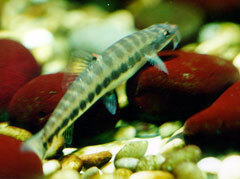 In the time that I've been involved with Loaches Online a lot of things have happened. It also chronicals my improvement in the art of fish photography. The pictures in the original article were taken with an SLR film camera. I'm somewhat better with a digital camera now. I have left the article pretty much as it was written. I've changed a couple of nomenclature items.....fish that were wrongly identified for instance, plus I've added some additional comments to some of the pictures. This is the original design concept I drew in 1998. I realize now that the intake sponges I drew were blue because I intended to use Fluval 4 Internal Power-filter sponge inserts. Subsequently, I found some 4" diameter black Pond-pump pre-filter sponges. I am still using those very same sponges 8 years later. Obviously made of a durable material. The design and experiences of a tank designed for fish from fast flowing Rivers and Streams. This was my first ever River-Tank setup in England. Rocks came from local Garden Cetres and the roots were collected in the local Thetford Forest. Because of the specialized environmental physiological adaptations of the so-called Torrent Fish or Hillstream Loaches, I felt that if I wanted to keep them I should provide, as near as was possible within a closed tank environment, conditions that approximated those in the wild. I wanted to provide a tank with vigorous water movement that was primarily in one direction , and strong aeration. Most Power-heads and Power-Filters used in regular tanks give a tumbling effect to the water, but don't give a uni-directional flow. I felt that a fairly long tank was needed and a way of ensuring rapid intake of water from one end, that would then be blasted back down the tank. I had a spare tank 44"long, 18.5"wide, and 15" deep. It's large surface area would give a good floor ideal for fish that don't need great depth to the tank. This hold approximately 44 Imperial Gallons. To give a good turnover, I used 2 Aquaclear 802 Power-heads. To produce the unidirectional flow, I devised a tubular manifold that would draw water through 3 Pond-Pump intake sponges to provide mechanical and biological filtration, and transfer it back to the tank via the Power-heads. This sits under the gravel like a regular Under-gravel filter. I have 4 tubes that run the length of the tank to carry the water. These are the sponge intakes that I used on my first tank. I bought a few more shortly afterwards, figuring they would need replacement and I could not buy them locally. This was in England. Now, I've been in Canada since 2001 and I'm still using those very same sponges. The tubing is three-quarter inch domestic overflow piping, and is assembled using "Osmaweld" glue. This effectively welds my melting the two joining pieces, and gives about 30 seconds working time before it won't move again, so positioning of components is vital. I test fitted everything before final gluing and put reference marks on each part to ensure correct alignment. After 24 hours, this is safe to use once flushed and cleaned in fresh water. A short length of 1" ID flexible plastic tubing was used as an adapter to better link to the conical uplift adapter provided by Aquaclear with the Power-heads. The manifold was covered by about 1.5" of 4mm gravel, and the tank filled with Rainwater, topped up with water from two other established tanks. The décor consists of numerous gray slate caves, and several large cobbles that range from 4" to 6" in size. A piece of Bogwood with Java-Fern growing on it, sits on an elevated area filled with gravel. This is about 6" deep and some Vallisneria is planted in it. Intake syphon for Fluval 303. It was discovered that the venturi action of the Power-heads didn't operate 6" below the surface, so a positive air-feed from the air-pump was provided. This is an overhead view of the left-hand end of the tank showing the sponge intakes at left and arrangement of rocks and roots. The right-hand end from above. 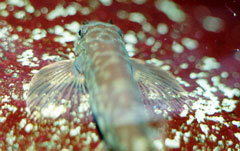 6 White-cloud Mountain Minnows (Tanichthys albonubes)were introduced for the cycling process. The use of some old water, plus small pebbles and the Bogwood from an established tank aided in rapid "seeding" of the system. I've just added a Fluval 303 to the system, again following the flow. This provides further water movement, and the facility of easy use of Carbon, etc., as well as giving further mechanical and biological filtration. I believe that the 3 sponge filters actually provide sufficient filtration for the stocking levels in the tank, as I've only cleaned them once, yet no reduction in flow ever happened. I just cleaned them to see how they were doing out of interest. 4 Gastomyzon were introduced after about 2 weeks. These took care of some blue/green algae that had developed on the root and on some of the rocks. As time has passed, a patina of reddish-brown algae has replaced it, and lately there has been the development of some greyish-green calciferous looking algae in places. The whole tank looks very natural and reminds me of a Reef tank in some respects. Liniparhomaloptera disparis.......note the patina on the rocks. Later, I bought 3 Nemacheilus masyai (originally thought they were Shistura savona), and 3 Shistura scaturigina, then 6 Liniparhomaloptera disparis and an odd-ball Nemacheilus/Shistura type Loach. The whole tank is very lively, and all the fish seem extremely happy. Apart from the Gastromyzon, they all seem to be growing well, but many say that Gastomyzon never seem to grow in tanks. My primary reason for creating this tank was to keep Homaloptera orthogoniata, as I had one once, and I'm determined to provide the best conditions for the next time I come upon these very rare fish. Several people have expressed an interest in the performance data for this tank. The tank holds (in theory) 44 Imperial Gal, 52.8 USG, 198 Litres. The Aquaclear 802's together pump 733 Imp.Gal/Hr, 879 USG/Hr, 3300 L/Hr. That means they circulate the tank's water 16 times per hour. The Fluval 303 pumps 188 Imp.Gal/Hr, 226 USG/Hr, 850 L/Hr. Therefore the amount of water being processed is 921 Imp.Gal/Hr, 1105 USG/Hr, 4162 L/Hr. This means that every minute about 15 Imp.Gal, 18 USG, 69L is being moved, so about a third of the tank's water flows through the filtration systems. This sounds fairly impressive, until you think back to standing by a fast-flowing stream. You know there's more water than that going past! A few people thought that I might be over-doing the flow in this tank before I got it up and running, but having watched a skinny little three-quarter inch Homaloptera sit quite happily in the blast from an Aquaclear 802, I'm convinced that I got it about right as these fish are designed by Nature to withstand far more water movement than this. I'm extremely pleased with the way this tank has worked out. It is extremely interesting to watch the lively action in the environment I've created. These fish are far more active than I've ever seen in any other tank, and I believe that is mainly down to the high levels of dissolved Oxygen which is what they are biologically engineered to live in. Anyone anywhere could basically duplicate this setup, using whatever equipment is available in their country. A little Math will give you a specification for a particular Powerhead combination that will give similar performance. I used 2, so that if one ever fails, the flow will not suddenly stop. It also gives a more uniform spread of flow in the tank. There are some flow reversals that can be seen by watching tiny bubbles in the water stream. At the intake end there is some slow back-flow, and there are eddies behind the cobbles in the low-pressure area that is created by the flow. Basically, though the objective of a primarily unidirectional flow is achieved. 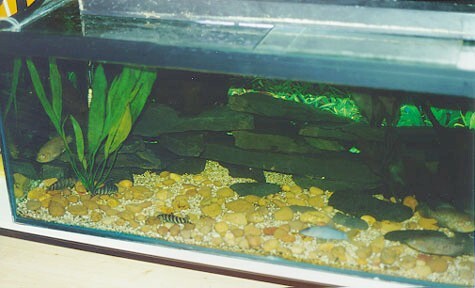 Here are a couple of other aquaria that I had set up at the same time in England. This is my 39x22x26 Clown Loach / Yoyo / striata/etc tank, complete with a big root and slate mass. This is my dario / modesta / lecontei / superciliaris / etc tank, with darios and a lecontei visible. In August 2001, I moved to Toronto, Canada. I had previously shipped over some fish that April, but brought my Hillstreams over as carry-on luggage. They lived in a temporary setup for a while until such time as we could move some other fish from an existing 65 gallon aquarium. On 11-09-2001, we left early morning for a camping trip up around Lake Superior. The WTC attack happened as we were driving up there, so I will always remember that trip. While travelling around, we collected rocks, driftwood, pebbles, even some gravel to mix with that already in the aquarium. The tank was set up without cleaning the gravel from the existing setup and its filters were used uncleaned so the tank was fully cycled in no time. Here are separate left and right-hand end closeups. Here's a picture taken in 2004. The tank had never been broken down since setup. This October, I removed some more predatory fish so that baby Hillstreams might survive. While doing that, I had to move most of the decor, so redesigned the layout. 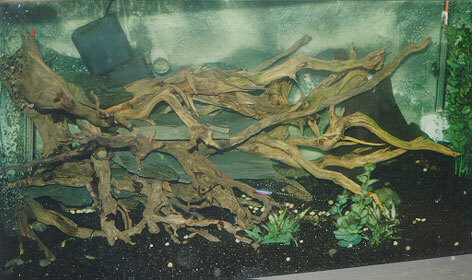 The tank still has the same pieces of driftwood in it collected back in 2001. The original River-Tank manifold is still in use in another aquarium.